Categorizing Data for Excel is an Excel add-in that allows the categorization of records in an Excel table based on a defined categorization criteria. Unique values in a column can be extracted and used to build another table with that data. Time can be grouped by frequency such as years, months, weeks and inclusive days lapsed. Stratification of data can be made based on a one to one correspondence. 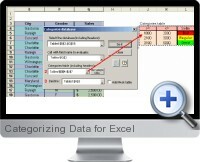 A column of data can also be separated into different parts and categories based on the categorization criteria. Extract unique cases - This tool extracts unique values from a column in an Excel table. Test the 'stratification table sufficiency' - examines the data and shows in a column all values not included in the stratification table. Stratification 1 to 1 - deals with the frequent need to categorize the data by stating a 1-to-1 correspondence. Categorize database - practical tool to categorize records in a table based on a category table. Time stratification - categorizes a table by adding one more column to the data being observed. To use this tool you need at least one date-type field in your table. Split field - splits an Excel table in multiple data groups according to repeated values in the selected field by category or by time.